Boots No7* have just launched lots of new deals for Christmas, and some of them are offer stacks to double up your savings! There's a new 24 Days Of Beauty Treats offer with a new No7 items on offer every, plus a 3 for 2 on skincare, and a free gift offer on cosmetics too! We'll help you stack those offers to get the very best deals right here. Mascaras now £10* Buy TWO get FREE Gift! 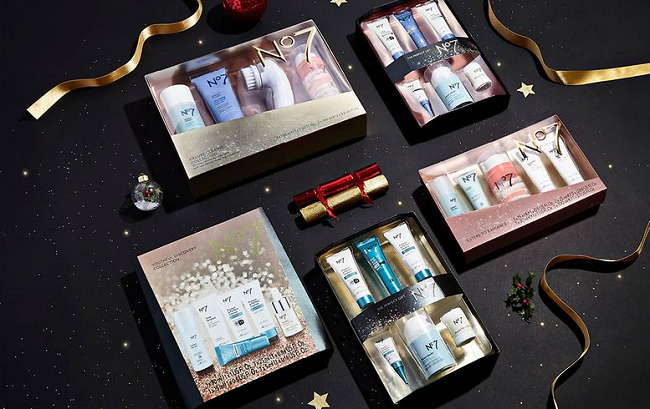 From 1st December Boots will be having a different No7 item on offer every day as their 24 Days Of Beauty Treats*, like an online advent calendar of offers. There will be an item of skincare or cosmetics each day at a special low price, with limited stocks available both online and in stores, so you might want to check out the new offer early each day so you don't miss out! Buy any 2 from a selection of more than 100 No7 cosmetics and beauty accessories and you'll get a Free No7 Gift Set* packed with goodies worth £31. Your free No7 Starry Eyes Gift Box* will add to your basket automatically when you have added 2 included items. The cheapest item are nail colours and base coats* at just £6 each, so buy 2 of those and you're getting £43 worth of No7 for only £12! Add any 3 No7 Skincare items from a selection here*and you'll get the cheapest one free of charge. Offer applies automatically at the checkout. SelectedNo7 Skincare Gift Sets* are now on offer for just £56 each, with contents worth £120+. Choose from Protect & Perfect Intense, Lift & Luminate or Restore & Renew. There are lots of No7 Gift Sets* included in the Christmas Mix & Match 3 for 2* offer at Boots, so you can buy any 3 and get the cheapest one for free. Prices start from just £8.50 for the smaller gift sets, and you can get 3 No7 gifts, or mix and match with any of the other 3 for 2 Christmas Gifts* at Boots. Ah this is a good deal too! I’ve ordered it for myself! Have I started a trend tonight?! Bugger i missed yesterday's deal and trust it to be the only want i wanted!! !